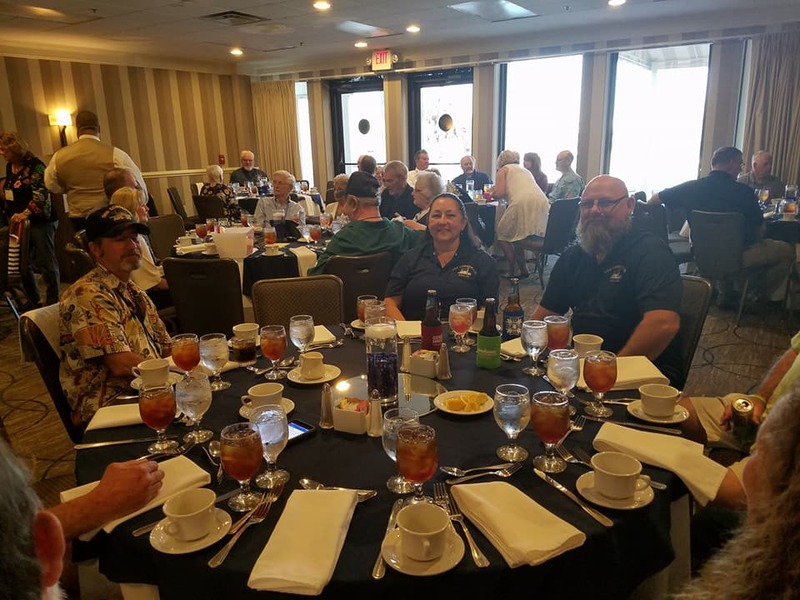 We gathered at the Hilton DoubleTree Hotel the last week of April to celebrate Conserver’s Sixth Annual Reunion. We have it on good authority that a good time was had by all! 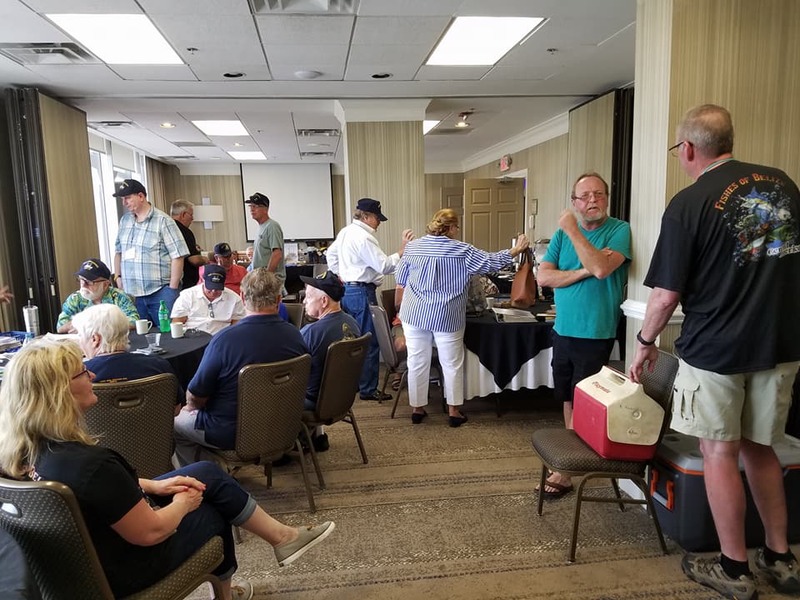 Our hats off and a hearty BZ to our reunion hosts, Kevin and Renee Weaver and the reunion committee, Dale and Thayes Hower and Keith “Doc” Hansen. The reunion got underway on April 26. However some of us arrived a few days early to get things set up and to go on a sunset river cruise on April 26th. The hospitality room was open every day and served as a meeting place for those attending. 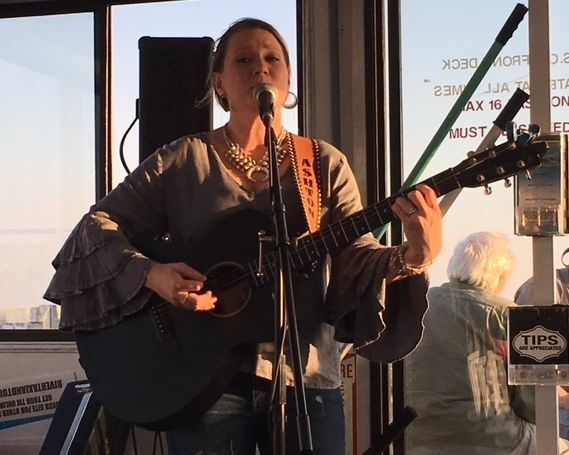 First day activities included the sunset cruise on April 26 with entertainer Ashton Taylor, shown in the photograph below. And entertain us she did! This gal needs to be in Nashville! The cruise took us up and down the St. John’s River as Ashton entertained us with her amazing repertoire. We didn’t get to see the sunset due to low clouds, but the scenery and Jacksonville skyline was beautiful. Ashton Taylor – We will hear from her again! The Perfect Attendance (6 reunions) award went to Lee Samuelson. Our youngest attendee was Fred Stevens. John Koontz travelled the farthest, coming from the great state of Washington. Conserver’s traditional silent auction brought 59 items to the table and raised over $1000 for our reunion fund. On Friday, April 28, we had the honor and pleasure of having Captain Colin Jones (ret) and his wife Judy pay us a brief visit. For those who may not recognize the name, Captain Jones was an Engineering Duty Officer and Diver who has served in many top positions in the diving and salvage navy, among them the Supervisor of Salvage. Captain Jones also headed salvage operations to clear the Suez Canal after the 1967 Israeli war with Egypt. He and Judy spent about three hours with us and it was great to see Colin reconnect with Conserver and Navy shipmates. 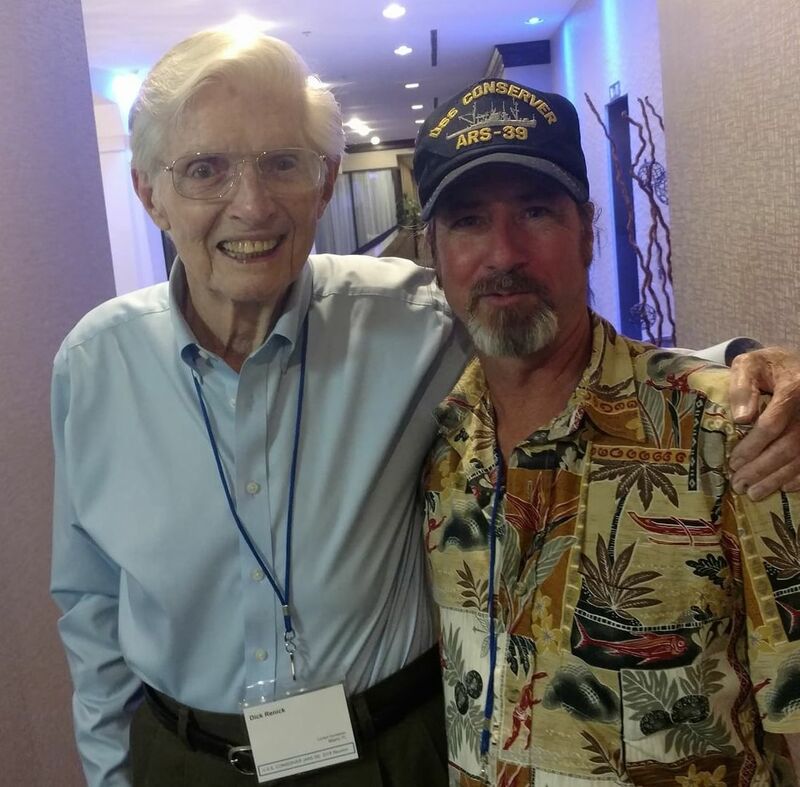 Captain Colin Jones (L) and shipmate Skip Lash – a war story for sure! The order of the day for April 28 included our business meeting held just before the Farewell Banquet. 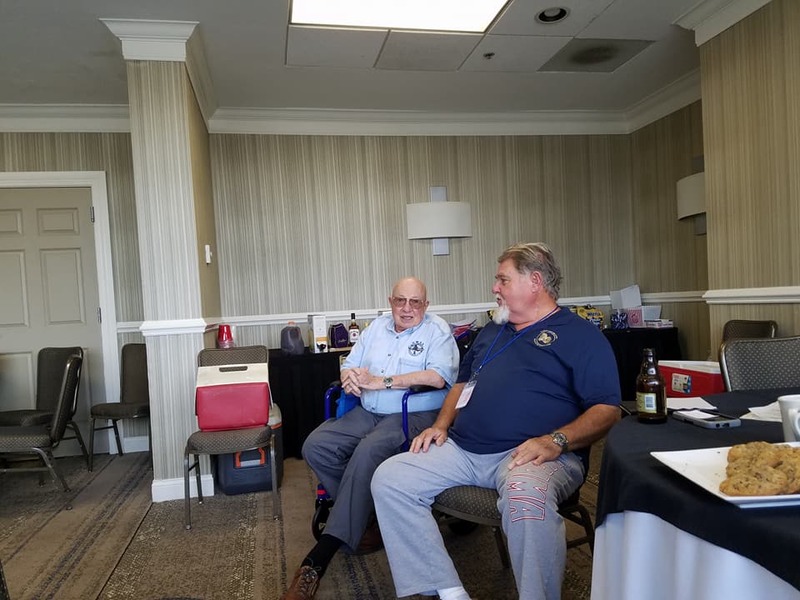 At the business meeting, we listened to a presentation by the ARSASR Association’s Jim and Mary Neal regarding the possibility of Conserver joining their group for future reunions. The crew unanimously agreed, feeling that the Conserver Reunion would lose its identity if we joined the ARSASR group. John Ackerman represented shipmate Pete Westbay, who had researched the possibility of our group sponsoring a memorial bench in Kinney Park at Shipyard Acres in Napa, California near Basalt Shipbuilding Corporation, where Conserver was built. The attending Crew Members authorized funding the bench and directed Pete to complete the project. The cost will be a one time donation of about $1300.00. Future Conserver reunion locations were discussed. Barring any roadblocks, the 2019 reunion will be held in Branson, MO during the last week of April. Stay tuned for specific information. Jeff Washburn volunteered to research the possibility of our 2020 reunion to be held in the Bay Area, preferably in or around Napa, CA. Again, more info will be coming. Following the business meeting, the Farewell Banquet commenced. The bill of fare was a wonderful DoubleTree buffet that everyone appeared to enjoy. A cash bar was also available for those so inclined! Notable events during the banquet were the award presentations and Senator Renick’s “replay” of that day back in 1947 when he reported aboard Conserver and, while onboard, obtained his G.E.D. high school diploma. He received a standing ovation. The “main event” was a naval history quiz put together and “administered” by Dale Geldert. Each table participated as the questions were put forward. The winning table was awarded the task of shaving the skipper’s beard, which did not happen! Those who participated discovered that some additional study may be required for the next quiz – and we have the feeling that there just might be one at our future reunions. The banquet ended with The crew and guests posing for the reunion’s official photographer, Renee Weaver. 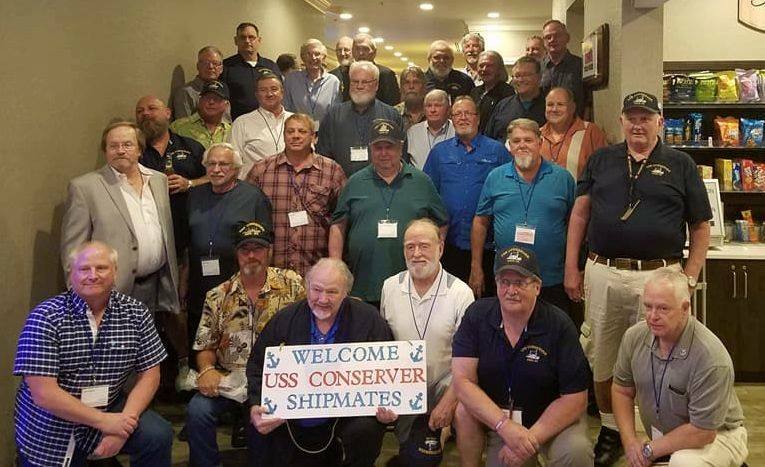 Check out our USS Conserver Facebook page for more stories and photos from Jacksonville. Stay tuned for information on Branson 2019! Hope to see you all there!